Founders’ Day at Manor College is a campus-wide tradition that brings together the Manor community to celebrate the school’s founders, the Sisters of St. Basil the Great. This year, the college celebrated Founders’ Day with an entire week of celebrations and special events honoring Manor’s culture of service and institutional history. Here are some of the events that took place! Monday began with the MLK Day of Service. Volunteers worked with TTF Watershed Project to help build “pollinator hotels” for bees that would be placed around campus, or served with NORC, helping older residents in the local community live independently by taking care of harder-to-do yard and housework. 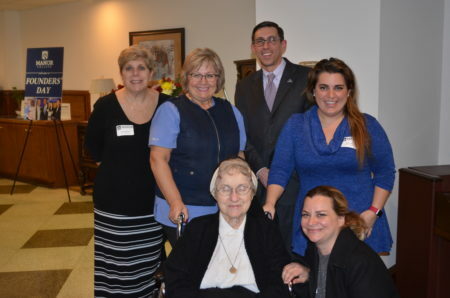 Tea with the Sisters took place at the OSBM Motherhouse on Wednesday. Student leaders,faculty, and staff were invited to join the Sisters of Saint Basil the Great for an afternoon of tea and lively conversation. 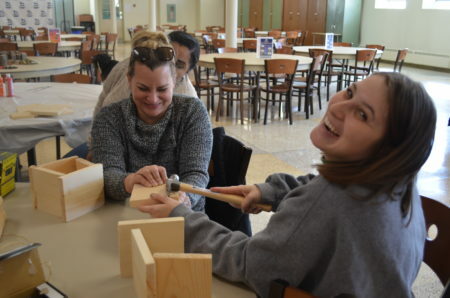 On Thursday, Residence Life invited everyone to some hands-on learning. 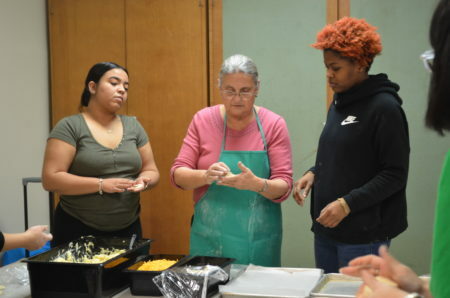 Students and staff alike created Ukrainian Varenyky by hand (similar to pierogies). The results were delicious! Learn more about this experience through the Manor College blog. 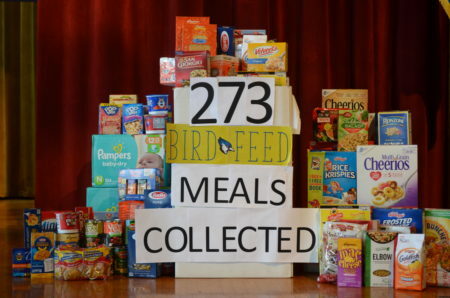 Throughout the month leading up to Founders’ Week, non-perishable meals were being collected for the Bird Feed student food pantry with a goal of 150 meals. An incredible 273 meals were donated by the college community! On Friday, the Founders’ Day Award Ceremony commenced. The Founders’ Day Address was given by PA Representative Benjamin V. Sanchez, Esq. The Educator of the Year Award went to Leslie Weinfeld in recognition of her outstanding commitment to educating students and fostering the spirit of lifelong learning. Several exceptional students were nominated for the Mother Josaphat Medal: Lynette Lark, Aviana Rios, William Rodebaugh, Nina Roller, and Brianna Taylor were brought to the stage as honorees. 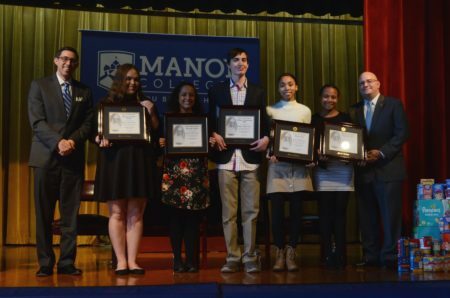 These students were seen by faculty and staff as exhibiting a responsible Manor College lifestyle, evidenced through reverence, respect, and service to the community. Will Rodenbaugh, a business major, was honored as the recipient of the Mother Josaphat medal. A Divine Liturgy in the stunning Holy Trinity Chapel, led by Father Peter Waslo, followed the ceremony. 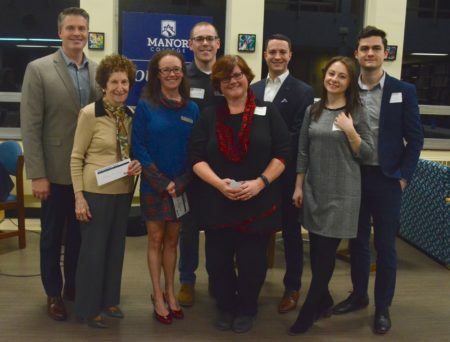 The Founders’ Day Reception on Friday night was an opportunity for students, staff, faculty and family to mingle, enjoy hors d’oeuvres, and celebrate the continued legacy of Manor College. The library was transformed into an intimate setting with live music, numerous bite-sized delicacies, and elegant decor. Following this, an Alumni Reception took place. Alumni met to reconnect with old friends and teachers while enjoying the festive reception atmosphere with beer and wine. To view more photos from the various events, visit our Flickr page!